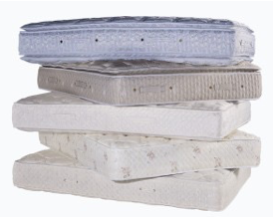 In reality both sprung mattresses and foam mattresses will often have similar amounts of foam and cushioned layers. It is the space taken up by the springs which has a large bearing on the increased thickness of the sprung mattresses. And therefore mattress experts agree, that despite this variance in depth, both traditional and contemporary mattresses can be equally comfortable. There is a difference in the type of comfort of both, not to mention other important characteristics. The memory foam mattress molds around the body, providing support to the most intricate nooks and crannies of the human bodies undulating surface. A huge benefit of the memory foam mattress is that it never needs to be turned – in fact memory foam mattresses are designed to be slept on without need for turning or rotating – a relief to the person who changes the bed! The memory foam is often touted as being much warmer than traditional mattresses – not so in the case of quality memory foam which is only slightly warmer – open cell technology makes memory foam mattresses breathable and exceptionally durable – they can bounce back into their original shape even after years of use! A reassuring statistic is that 75% of the mainland European market opt to sleep on memory foam mattresses – a strong endorsement surely! The urban myth that all memory foam mattresses are exceptionally warm grew out of the import of cheap Asian foam and latex mattresses that hit the UK and ROI market in the mid 2000’s. Perdormire offer warranties of up to 10 to 12 years on some of their product. Other important features worth mentioning include anti-dustmite and hypo-allergenic properties – perfect for anyone with respiratory or allergy issues. In the next blog we will look a little more at sprung mattresses and the comfort and support they can offer the user! Consumers can call in to the Drumbriston Furniture outlet on the Dublin Rd, Monaghan Town for a full selection of these and more products. For more information click on www.drumbristonfurniture.ie For trade contract enquiries please get in touch with us on this site.